Syrris’ sister company, Dolomite Microfluidics, has launched new flexible, cost-effective Dolomite Flow Chemistry Systems at the 250th American Chemical Society Meeting and Exposition in August 2015. 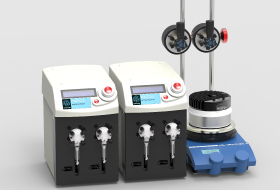 The Dolomite Flow Chemistry Systems are designed to provide excellent control of residence time, reaction temperature, stoichiometry and reagent introduction, for performing detailed flow chemistry experiments. The systems include a choice of glass microreactors or tube reactors in PTFE or stainless steel from 2.5 µl up to 16 ml. The TCU-125 Temperature Controller ensures accurate temperature control of chips from 1 to 125 °C, while the tube reactors can be heated from room temperatures to 250 °C using a hotplate. The high performance and robust Mitos Duo syringe pumps ensure extremely smooth flow rates, from 1.0 µl/min to 10 ml/min, and allow use of the two syringes independently, or in one continuous flow, up to 6 bar. For more information, please visit the Dolomite Flow Chemistry Systems.